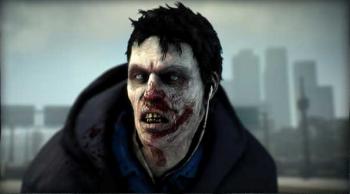 Dead Rising 3 uses procedural generation techniques to build its zombies piece by piece, so in theory no two zeds will be the same. Wounds from being eaten alive by the undead are a lot like fingerprints: no two people have the same set. That's the case in Dead Rising 3, at least. Rather than building giant hordes from the same handful of character models, the developers at Capcom randomly construct each enemy from a big pile of body parts like a ghoulish Mr. Potato Head. "You'll never see the same zombie twice," boasts Capcom producer Mike Jones. "It's all procedurally generated: hair styles, clothing, colors, textures. And the gore is too: missing jaws, missing eyes... it's all totally dynamic. That's a whole system that we built. We didn't just model the zombies, we had to model the pieces and the system puts them together." Dead Rising 3 is drawing on the power of next-gen consoles to make its environments more diverse, in addition to its hordes. "You're looking at more custom work and less reuse," says Jones. "Every building and every interior in Dead Rising 3 is handmade and hand crafted ... Absolutely it costs more money and more time. But ultimately it yields a more unique experience and you'll run through the world and know where stuff is without looking at the map because everything has its own feel." You'll be able to admire each zombie's individuality as they're gnawing on your brains when Dead Rising 3 launches alongside the Xbox One on November 22.